One of two things…or both? So I recently went to an allergist. I’ve had seasonal allergies all my life, accompanied by a post-nasal drip that just never goes away. I had been seeing my doctor, trying to figure out what I can do to calm my symptoms and they finally sent me to a specialist. 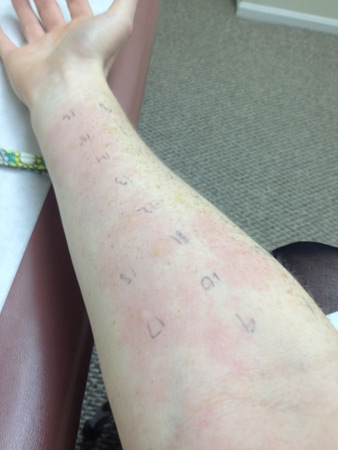 Needless to say, I’m highly allergic to numbers 1 – 18, which included all the outdoor stuff; grass, flowers, trees, etc. 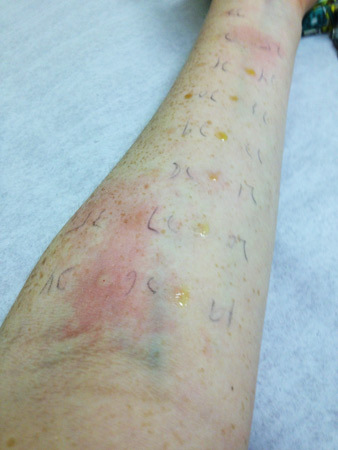 Number 17 was Bermuda Grass and the reaction from that test spread all the way up my arm! Looks like my lifelong streak of no grass-cutting will continue! Numbers 19 – 35 included indoor stuff; mold, mildew, dust, etc. 26 and 27 are dust mites. Who isn’t allergic to dust, really? My major takeaway from this is I need to find an allergy treatment that works for me and just stick to it. My secondary, house-related takeaway requires one of two things…either I stop doing yard work all together or we get hardwood floors! Or maybe…BOTH?! Truthfully, I won’t stop doing yard work. I was just out Sunday night hacking up the earth trying to rid the ground of pesky dead(ish) ivy vines. It was a HUGE stress relief. Yard work is good like that. There’s a method to the madness and you are allowed to be actually mad about the work! It’s fabulous. I actually enjoy picking up sticks because it’s a really great workout! Have you ever done full on squats for an hour straight? Go pick up sticks in your yard and you’ll feel the burn! To the hardwood floors comment; it’s definitely on the top of our “to-do” list. When Andrew ripped up a good chunk of our living room carpet to install our makeshift landing, we revealed some pretty decent looking hardwood. After speaking to some of the adults in our lives, we’ve come to the conclusion that having the floors re-done may actually be within reach – like this year or early next year reach! Long story short, not much has changed having been officially diagnosed with tons of allergies to trees and such. The best part about it is that it will spark the motivation we need to prioritize projects. Maybe hardwood floors will be next! Can we see a picture of your floors? This entry was posted in About Us, Around the House, Backyard and tagged allergies, backyard, diy, diy and home improvement tips, hardwood floors, home improvement, yard work by Megan. Bookmark the permalink. I’m in the same boat you are with allergies. Once I get started with outdoor projects I generally need to take Claritin and non-drowsy sudafed every day for a month or so. Stinks, but I’d be a mess without it. Yep! Allergy meds can work wonders!